What Odor? 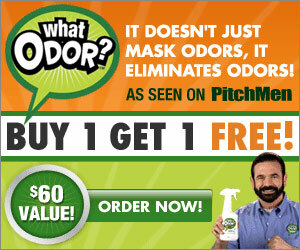 doesn’t just mask odors, it will completely eliminate them. Most odor eliminating products just mask the smell but with What Odor? it eliminates the smell from the source. Other products can use unsafe ingredients but What Odor? is non-toxic and safe for the environment. In fact, for every order, they will plant one tree to help the environment. Order now and they’ll send you two 16 ounce bottles of What Odor? along with two 6 ounce travel size bottles. That’s right! This DOUBLE OFFER is all yours today for only $19.99 plus $9.99 to cover the processing and handling.